While traveling home one late afternoon, I couldn’t help but take a quick photo of a jeepney in front of me that was belching smoke while also carrying several people as sabit (hangers). 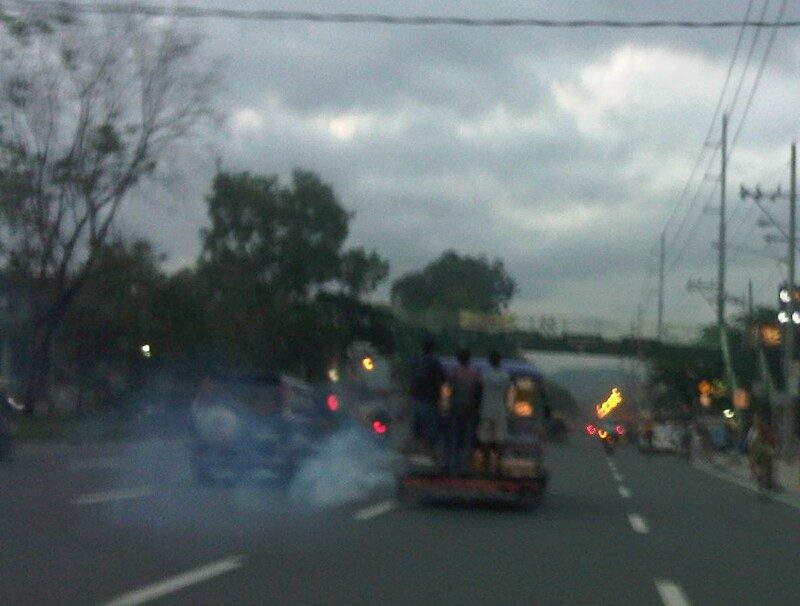 Though a bit blurry, the photo still shows clearly the cloud of smoke coming out of jeepney’s tailpipe and the three people hanging behind the vehicle. Not obvious from the photo are the speed and lateral motion of the jeepney as it traversed this section of Marcos Highway. This is a scene we see everyday in our streets despite initiatives or efforts to address problems pertaining to vehicle emissions and safety. The Clean Air Act while enacted more than a decade ago has not been effectively implemented for vehicles. A lot of vehicles are able to register or renew their registrations without really going through a proper emissions test (or smog test for those in the US). “Non-appearance,” the term used for people going through the motions of a test but skipping the measurement itself while getting print-outs stating the vehicle “passed” the test is prevalent throughout the country. The Land Transportation Office (LTO) has experimented with a lot of schemes to address the problem. These includes the requirement of a photograph showing the actual performance of the emission test on the vehicle. More recent was an initiative where RFID units were supposed to be installed/attached to vehicles and these would be used to ensure that emission tests really were conducted prior to registration. However, with very few Motor Vehicle Inspection Stations (MVIS), the LTO has no choice but to delegate emission testing to private emission testing centers (PETCs). The long standing suspicion, however, is that most of these PETCs collude with vehicle owners and fixers within the LTO to maintain a status quo in “non-appearances” and non-compliance with emission regulations. Local governments have pitched in with their mobile anti-smoke belching units (ASBUs). In Metro Manila, many cities including Quezon City, Pasig City and Makati City have multiple ASBUs allowing them to set-up several stations along roads in their jurisdictions. These are usually seen along busy roads with policemen assisting them in flagging down vehicles (mostly trucks) observed to be smokebelchers. These vehicles are tested and penalties are imposed on emission regulations violators. The equipment of these ASBUs, however, are only for diesel engines and so are operations of these mobile units are limited in scope from the start. There have also been allegations that some ASBUs have been taking advantage of erring drivers resulting in bribery so as not to be issued violation tickets and penalties. The bottom line for most cases of emission violations is that most violators are not properly educated about emission regulations including the requirement for them to pass emission tests at any time and not during the registration process only. This is a fact that most drivers or vehicle owners do not understand or choose not to understand, usually because of maintenance cost implications. Nevertheless, we will continue to be in the losing end of the war against air pollution if we cannot properly enforce provisions of the Clean Air Act, particularly for mobile sources that contribute most of the air pollution we experience in this country. By d0ctrine in Air quality, Behavior, Policy, Road Safety on March 8, 2013 .